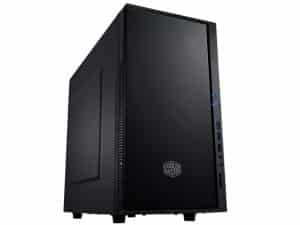 Computer cases and accessories manufacturer Cooler Master has decided to shrink its Silencio line of computer cases to the mATX format. The new case, dubbed Silencio 352, aims at bringing silence, performance and looks to the enthusiast market, all at a very attractive price point. Cooler Master is aiming for a case that offers both performance and silent operation with its latest addition to the Silencio line of products. Both side panels as well as the front door of the case are lined with noise absorbing foam to decrease noise emitted by fans and hard drives inside the case. 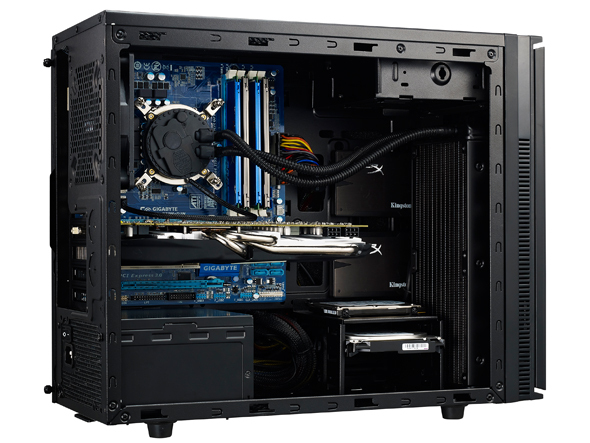 The case comes with top, bottom and front dust filters to help keeping the dust out of your system. The new Silencio 352 offers the ability to mount a 240mm standard double radiator in the front, which is a very interesting feature for a mATX case. If not opting for a water cooled setup, the case allows for heatsinks up to 155mm (6.1″) in height to be installed, while the maximum length of the graphics card is up to 355mm (14″). The motherboard tray features the ubiquitous CPU cutout for easy cooler installation. The Silencio also features a lot of mounting options for HDDs and SSDs. We can’t say the same of all mATX cases out there. This one will fit a total of four 2.5″ drives and 3x hard drives, if no other 3.5″ is installed in the front-accessible bay. That upper 3.5″ bay is removable and must be in order to install a 240mm radiator. The new case measures 200 x 378 x 453mm (7.8″ x 14.9″ x 17.8″) and weights in at 4.7 kg (10.3 lbs). The front panel features audio connectors, one USB 2.0, two USB 3.0 Super Speed and an SD card reader. The front door hides one 5.25″ and one 3.5″ drive bay and a removable dust filter for the two 120mm intake fans. The overall design of the case is monolithic with only straight lines and right angles. This new case brings a lot to the table with its cooling options, noise absorbing material and overall good looks. The connections options on the front panel are also an added bonus. No price yet for the north American market, but TechPowerUp reports that the case is launching is Europe this month for €54/£47. 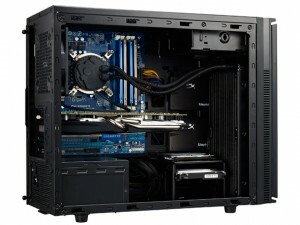 More product details and pictures at Cooler Master.